While winter is not my favorite, mittens are! 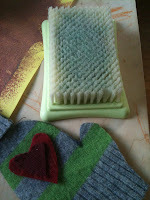 There is something about mittens that I love, which is probably why I make mittens for the girls every year. What has now become a tradition, started 3 years ago after the Bee was born and I couldn't find a warm pair of mitten small enough for her little hands. So using an old sweater, that I never wore, I made her a pair. Now she is old enough to be part of the process, selecting the patterns and decorations she wants on her mittens. The mittens are pretty easy to make and last year I started adding a L or R to the palm of each mitten to help the girls learn their left and right. 1) Start by selecting an old wool sweater, or at least mostly wool, I have found that sweaters with at least some percentage of wool work fine. You can usually check the tag in the back of the sweater to find out if it has some wool in it. I often just go to a thrift store or yard sale to pick up a few old sweaters, and usually only pay a few dollars at the most for them. At this point I have a pretty good collection of scraps! 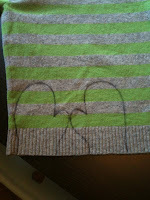 2) Felt the sweaters by washing them in the washing machine on very hot and then throwing them into a warm dryer. This just tightens the fibers in the sweater. 3) Trace the hand of whom ever you want to make the mittens for onto a piece of paper. I find this to be the hardest part of this project and if you have ever tried to trace the hand of a busy 16 month old you know why! 4) I then draw a line draw a line at an inch around the hand tracing (see picture below.) This makes sure there is room for a seam and a little extra wiggle room for growing hands. 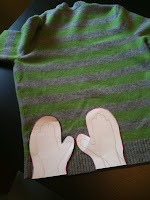 5) I then cut the tracings out of the paper and trace them onto the sweater with a sharpie marker, or if the fabric is darker with a white colored pencil or chalk. I trace the hands at the waist of the sweater that way the ribbing becomes the stretchier part that goes around the wrist and keeps snow from getting into the mitten. 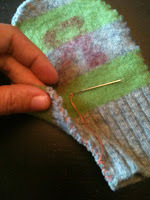 You can also use the arm for this, especially if you are making little mittens. 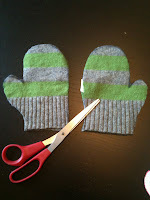 6) I then cut the mittens out of the sweater, being careful to cut two pieces at once. 7) I then add some decorations to my mittens, you could skip this step entirley and still have some beautiful mittens. 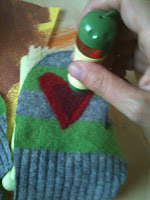 However if you want to add some decorative touches, start by cutting out the designs you want from another felted sweater or even a piece of felt. 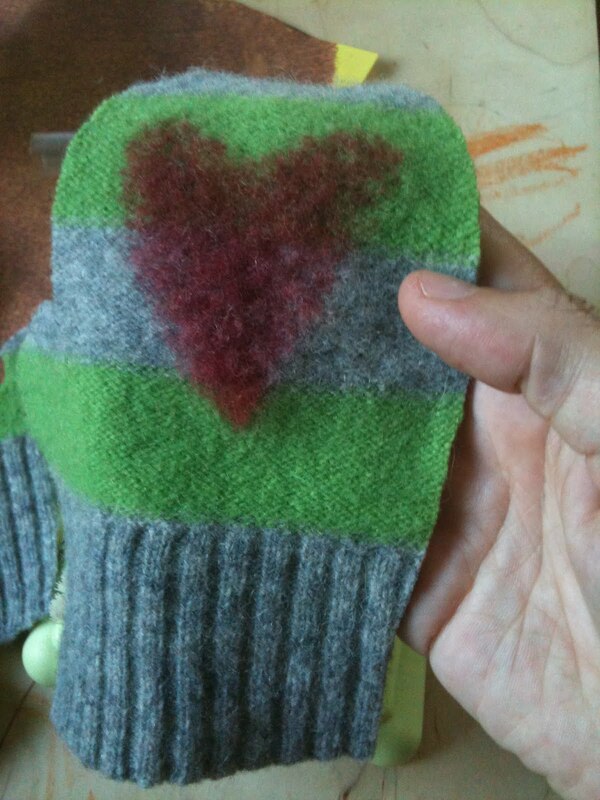 This year the Bee choose hearts for her mittens which I cut out from a scrap I had. 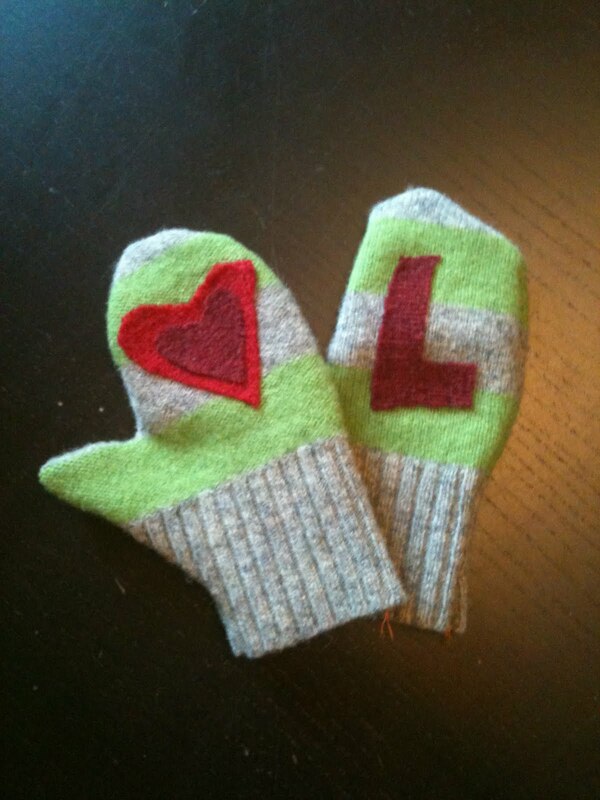 I also cut out an L and R, to put onto the palms of her mittens. I started this last year and it really has helped her to start to recognize her rights and lefts. 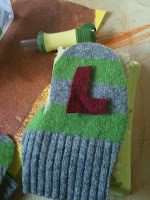 8) Once I cut out the shapes I lay them out on the mittens where I want them to go. This is especially important for me because I always have a hard time imagining which will eventually be the palm and the top and which will be the left and the right. 10) Once you have needle felted all you pieces together you then need to put the two sides of the mittens face side together, so that what will become the inside of the mittens is facing outwards. 11) Then using a sewing machine or by hand sew around the edge of the mitten, on 3 sides leaving the bottom open for the hand to go through. 12) After this your mittens are done and you are ready for the first cold days of winter. I especially love your addition to this autumn tradition...the left and right marked on the palms. What a simple way to add a little help to getting mittens on the right hands (and to teach them to do it themselves at the same time). Now wouldn't that be neat if I could just get our little one to get his shoes on the right feet? I love your much-better-than-store-bought hand warmers!